Slowly but surely, more interesting boxed wines are appearing on store shelves. 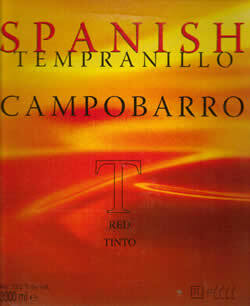 A good example is Campobarro Tempranillo (non-vintage) from Spain. This is the first Spanish Tempranillo I’ve seen in a box. Like many inexpensive Tempranillos, this is a fine, if undistinguished, table wine. It has a fruity nose, with red berries and medium tannins on the palate. It’s not overly complex and the finish isn’t memorable, but for the equivalent of less than six bucks a bottle it’s very drinkable. The wine is labeled as “Vino de la Tierra Extremadura,” indicating that it is from the Extremadura region of western Spain. The winery seems to be Bodega San Marcos, and the importer San Antonio-based Makin Wines International. The San Marcos website doesn’t reveal too much about the winery, sadly, and I haven’t seen any other boxed products from them. Don’t expect to wow your oenophile friends with this one, but if you are looking for a chance of pace from the more common-seen boxes of California Cabs and Australian Shirazes, Campobarro Tempranillo may be just the ticket. This entry was posted in Box Wines, Red Wines, Tempranillo, Wine Reviews and tagged bodega san marcos, extremadura on February 4, 2011 by Roger.